The ever-popular mono-White Myr of Mirrodin clawed their way back into the limelight as Sam selected them as the opposition deck for todays’ feature matchup against the Infect-based Phyrexian Poison. Would the tribal Artifacts build up enough steam to overrun Phyrexia’s finest, or would they be withered down to nothing and ground beneath a toxic Green-Black heel? We sat down to find out, and here are our research notes. One concern we’ve heard with Magic’s preconstructed decks is that the rare cards can make them a bit swingy, since there are so few of them but with so major an effect. Games, in that view, become something of a race to see who gets theirs out first. Although we don’t necessarily subscribe to that viewpoint, this game would provide some rather compelling evidence in favour. On the play, Sam draws her seven, looks over her grip, then plays a Plains. Over to me, I match with a Forest and pass back. Showing some of her deck’s quick potential, Sam gets out a turn 2 Gold Myr for a little mana ramping. I play a second Forest, and have nothing else. In fact, my hand is something of a gamble- no Black mana sources, but Ichor Rats and Hand of the Praetors I felt it worth a shot. I’m watching Sam’s development warily, hoping she doesn’t explode out of the gate as swarm decks often can. Turn 3 arrives, and Sam trots out the Darksteel Myr. It’s an overpriced, steaming pile against an Infect deck and she knows it, and I take it as a good sign. Still, she swings in for 1 with the Gold Myr and turns it over to me. I play a third Forest. Next, Sam’s drawn into an Origin Spellbomb and plays it, swinging in again with the Gold Myr. I’m now at 18 life. I play a fourth Forest. Sam swings in once more on turn 5, then lays down a second Origin Spellbomb. I play a fifth Forest. Sam tries to spice my turn up a little bit by popping one of her Spellbombs to get a 1/1 Myr token and an extra card. Untapping for turn 6, Sam swings in for 2 with her Gold Myr and Myr token. Desperate for a break, I blow a Slice in Twain on the Gold Myr. It’s not a play I’d ordinarily be enthused to make, but I have both Slices in hand and can afford to blow one for the cantrip as an emergency measure. Success! I pull a Swamp, and am ready to bring the Hand of the Praetors on-line. Not only that, but my turn 6 draw is a second Swamp, which gives my Ichor Rats some cheer. I drop the Hand, and pass back to Sam, who pops her other Spellbomb at the end of my turn. Sam’s board position isn’t the best, but she’s just one Myr Galvanizer away from being a very ugly threat. She drops a third Spellbomb, and passes, and I feel like I’ve turned the corner. Turn 7, and I drop my second Swamp. The mana flood/screw situation was tough, but all my weapons are now options. 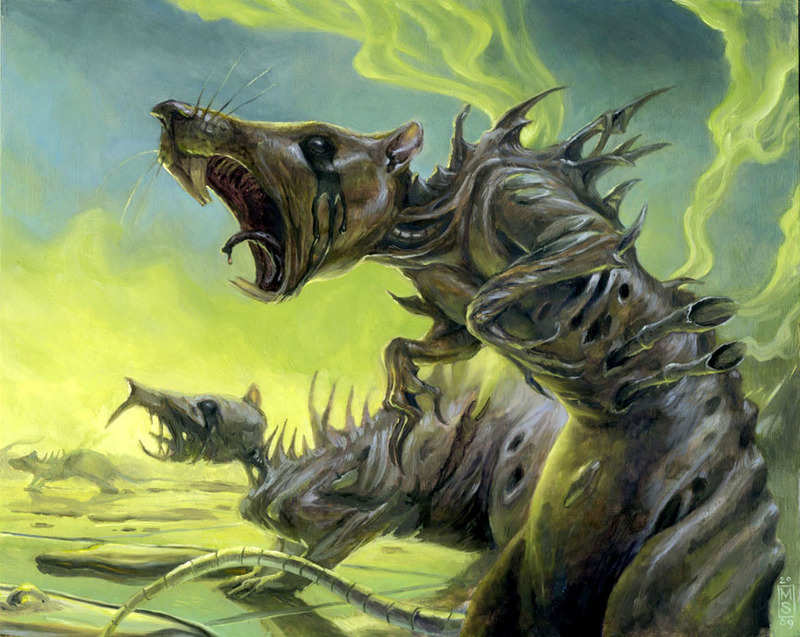 I play the Ichor Rats, giving Sam 2 poison counters (PC’s)- one from the Rats and one from the Hand. With all that Land, I’ve enough left over for the Tangle Angler (+1 PC, 3 total). Sam detonates her last Spellbomb at the end of my turn, drops a Plains on hers and passes back. I lead my first attack on turn 8, and I’ve already managed to hit Sam for 3 PC’s- the equivalent of 6 damage. The Rats and the Angler charge eagerly into the red zone, and I activate the Angler’s ability to compel her Gold and Darksteel Myr to block it, killing the both of them. Sam gladly trades out two of her 1/1 Myr tokens for the Ichor Rats, so nothing gets through. Still I make progress, however, when I cast the Contagious Nim, adding one more poison counter to Sam’s total. She now has 4. Sam hits the accelerator on turn 9, with a Myr Galvanizer and Perilous Myr replenishing her defences. I swing in again after she passes, using the Angler to grab all her defenders’ attention and leave the path clear for the Nim, who gets a Giant Growth to finish Sam off at 10 PC’s. Obviously, this game hinged almost entirely on the Hand of the Praetors, and without that one card I might well have succumbed. 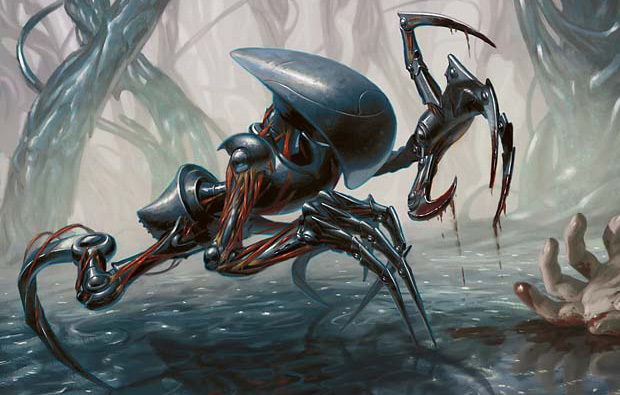 At this point, it’s hard to imagine an Infect deck without making that monster a 4-of, it’s just that good. Of course, I only have one in the precon, and two games to go! A fast start for Sam here, with a turn 1 Spellbomb into a turn 2 Myrsmith. My first counter comes on turn 2, with the very solid Ichorclaw Myr. I’m a big fan of this card here- he’s a 1/1 Infect (so he’s effectively hitting your enemy for 2) who becomes a 3/3 when blocked. Since you’re not going to see a lot of turn 3 4/4’s, he’s almost always going to either get in on your opponent or trade out with something bigger than it. Sam misses her turn 3 land drop, though, and I keep the pressure on with a Cystbearer after swinging in with the Myr (+1 PC, 1). Sam pops ber Spellbomb at the end of my turn. Some relief is in sight for her on turn 4, when she misses her second drop in a row but draws into a Gold Myr. Unhobbled by such misfortune, I bring out Bladed Pinions and Equip them to the Cystbearer, swinging in for +3 PC. Sam drops another Origin Spellbomb on turn 5, adding another Myr token thanks to the Myrsmith, then swings in for 4 taking me to 16. I untap, play a Forest, then cast Ichor Rats, taking Sam to 5 poison counters. I then go in with the flying Cystbearer and Ichorclaw Myr. Her chumping on the ground is irrelevant as the flying Cystbearer gets hit with a Giant Growth, gifting Sam with 5 more poison counters and a very swift game loss. The ubiquitous Origin Spellbombs make another appearance to lead off game three, and Sam follows that up with a turn 2 Gold Myr for a solid enough start. For my part, I deploy a turn 2 Necropede before passing. Turn 3 comes, and Sam throws out the disposable Darksteel Myr. I swing in for +1 PC in return with the ‘Pede, then follow up with the Bladed Pinions. Sam gets a nick in on me the turn following, sending in her Gold Myr to do her dirty-work. I push the ‘Pede back into the red zone (+1 PC, 2), then deploy a Heavy Arbalest. The Arbalest is a fairly weak card, but becomes twice as effective when attached to Infect critters. I’m willing to give it a try. At the end of my turn, Sam detonates her Spellbomb for a 1/1 Myr and a card. It’s now turn 5, and Sam augments her forces with a Perilous Myr, another of the stronger early cards in this format. She swings in for 1 again, and I’m down to 18. For my part, I return in with the Necropede, taking her to 3 poison counters. Sensing weakness, Sam goes up over the trenches on turn 6, with the Myr Perilous, Gold and Darksteel making the run. The Darksteel’s 0-power is a sign she’s either bluffing the trick or has one, but either way I don’t mind taking the damage. Turns out, she’s got the trick- an Inspired Charge, but I have one of my own in response and punish her sloppy play. I cast Carrion Call before declaring blockers, and instantly have a dirty pair of 1/1 Insects with Infect. I opt to let her Perilous Myr through, since its death will likely take my Necropede with it, but the Insects trade out with the other two Myr. Back to me, I swing in again with the dependable Necropede (+1 PC, 4). Sam’s had enough, and now abolishes my ‘Pede with Revoke Existence. Since it’s exiled, it never hits the graveyard and thus doesn’t drop a lovely counter on her Myr. At the end of her turn, though, I cast a second Carrion Call, and am back in the game with some critters. Passed to me, I equip the Arbalest onto one of my bugs and tap it, while sending its mate into the red zone, combining to take her up to 7 poison counters- the danger zone. Sam’s battling back, though, with an Arrest on the unequipped bug taking it out of commission. She then swings in for 1, taking me to 13. Undaunted, I equip the Arbalest to the Arrested bug. It won’t be able to take advantage of the granted ability, but it does free up the un-Arrested bug to untap as normal next turn. I follow up with Ichor Rats, and voila! An eighth poison counter to Sam. Sam’s beaten and she knows it. She gamely passes back after laying down a Plains, holding her Perilous Myr back for chumping. It doesn’t matter- I reattach the Arbalest to the free bug, and finish Sam off with it. Although I still remain unconvinced by the rather scattershot supporting cards in the deck, the Infect beasties obviously got the job done against the Myr. Part of this is because the Myr don’t get very big, and Sam was unable to mount a strong enough defense to hold her ground. That said, game one was won on the back of the Infect Lord, Hand of the Praetors, the second on the evasion-granting Bladed Pinions, and the last thanks to the Heavy Arbalest. It should be said that in tinkering with the deck, the Hand might be the only one of the three I’d keep. Despite some questionable card inclusions, the core of the deck is very solid, and Infect is the real deal. Not only that, but having played with the “Poison Counters” mechanic back in Legends this is far, far superior and tremendously fun to play. But still it’s quite a cool matchup from which we can learn that the Myr deck clearly needs to focus even more on it’s strength, ie the swarm element, whereas even more evasion would really spoil a Phyrexian opponent’s day. To choose from either Whispersilk Cloak or Trample, I’d pick the latter one, as the threat level doubles: Granting trample to the infecters is putting a statement such as “You AND your creatures are in danger” on the table. Keep up, I enjoy reading your reviews. One of the best things the Myr deck could do is augment its strength further. It has so many ways to get Myr onto the battlefield that it will almost never fail to find great advantage from pumping what it’s got rather than worrying about even more. A couple more Galvanizers and- as troacctid’s commented- some Tempered Steel and this deck will move a full notch up. I’m still enamoured of the Cloak, because it blanks all of their removal except artifact hate. Granted, there’s more of that then normal in the SOM sets, but it’s a simple solution to the Phyrexian’s deck’s problem of getting outclassed in the mid-to-late game considering that most of the critters are on the small side. Thanks for your comments, we enjoy those as well! This intro pack seems quite strong after winning all three games, but game 1 it took a big risk. The other times though, it seemed almost as if the myr were not doing much. The only time I felt that they were a potential threat was when three attacked backed by an Inspired charge, and even then it was only three attackers. Poor myr, but wizards should be the one to blame for this unbalance. 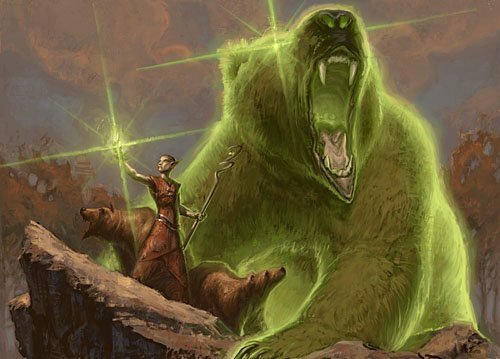 Otherwise it is a very interesting deck and it Infect started quite solid with the golgari colors.